- Use the standard automation part when you turn on / start your layout. Write a little automation sequence that allows turning on off / turn on all the sounds and lights. set your initial routes and have a safe and pleasant start. Easy to make and a great help. - And accordingly if you end up having too many sounds and other functions, turn them all off in one sequence. Silence is also nice. - Loco names can be used from any word. From release 2.0 we will also support combined names with numbers. Please select names which distance themselves somewhat from other by the sound. And use names with some sound volume. Long names are fine. The same counts for the figures for the switches and signals. Numbers from one to eight are usually easily recognizable while nine often is snapped off. 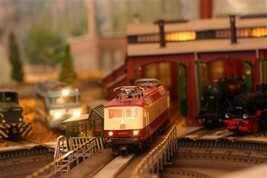 - You will immediately try to automate and synchronize trains using the automation. With GT-Position you have all blocks available which you can draw. If you have standard feed back modules like S88 you can still apply less than normally if you use the timer in the Automation program. 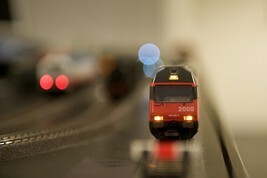 See the enclosed PDF with a two train shuttle control example. It can be done a lot more detailed, more virtual blocks can be inserted, more stepwise accelerations, more security control, more sounds, etc.. However, it can also be done quicker or more aggressive - - it is all up to you and your temper. Even the simplest thing on an automated layout requires some training. In the enclosed document we have shown how to voice control and automate a main track with a stop track, a switch, and a feed back module. If you do not want to automate right away you can wait with the feed back module. How to build a turntable control with GT-Command. We want to use voice control or automation for the turntable and we want to automate the driving and set routes where the turntable is part of that. See the enclosed pdf-file . If you use GT-Position, then place a sender on the bridge (on the house). Then you can automate your bridge turning to whatever connecting track putting small virtual blocks next to every exit.